It’s LOCAL! It’s LATE BREAKING! It’s The Best in LOCAL ENTERTAINMENT & The Cultured Pearl’s MONDAY NIGHT SUSHI SPECIAL! With Live entertainment from your favorite local artists. Sushi specials, house cocktails and desserts! 2013 Monday Night Special Sushi! Park at GRUB… Sing if you want… Jam if you play… Stare at the stars… Howl at the moon! New entertainment and a new store! Happy Thanksgiving! We are proud to present our music line up for this winter and our new Pearl Essence Online Store!! First, the music line up! 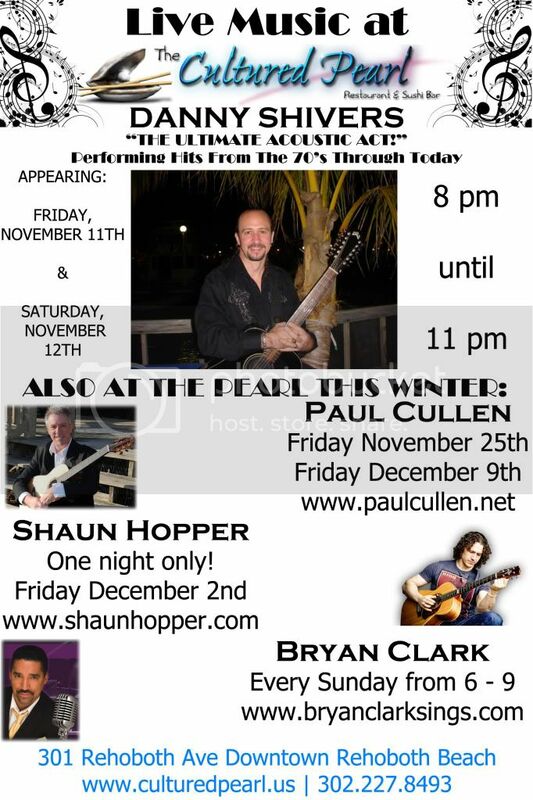 Dec 2 Shaun Hopper - One night only Special Even!! The New Pearl Essence Online Store is Up!!! Click the image and check out the new store, and get all your holiday shopping done from the comfort of your home! Pearl Essence is the Cultured Pearl Restaurant's Japanese gift shop, located at the Pearl Mall. We have a wide variety of Japanese items, from chopsticks to beautiful Japanese ceramics and dishware. Pearl Essence is also the home of artist Maiko Saleff's Artwork. You can find her paintings and t-shirts all at Pearl Essence. And if you dine upstairs at the Cultured Pearl you get 10% off at Pearl Essence with your receipt for that night! Read more about New entertainment and a new store! Happy Thanksgiving! Read more about Winter music line up! New Menu! Updates on entertainment Staring Bryan Clark and Classic Sundays coming this week!! The menu has been fully updated! We've added new rolls, entrees, seasonal drinks and desserts! Check out the menu tab for all the delicious updates! And don't forget about the new entertainment at the pearl! Classic Sundays with Bryan Clark!